On 1st October 2017, Navdanya launched the international campaign for Poison Free Food and Farming at Bhoomi Festival 2017 “Listening to the Mountains” in New Delhi, which was organised in collaboration with India International Centre. Communities in the Alps which have become pesticides free have joined with Himalayan communities that are chemical free to create a global network of poison free Organic zones. Being the 30th year of the Navdanya movement, a special ceremony to honour the Navdanya family was also organised, which included seed keepers across the country, farmers, women processors, teachers and other individuals who have devoted their lives to make Navdanya evolve froma seed to a tree. 30 members of the Navdanya family were felicitated at the event . “Today, humanity is facing a great crisis because of a man made disaster, Climate Change. To combat this threat we have to adapt, and amend our ways. Even in our Sikkim climate is changing, longer summers, irregular climate patterns marked by heavy rainfall and landslides. We have to change now, we have to stop interference with nature and remove the poisons from our food and farms. I will play my part in the mission to make Himalayas 100% organic,” he added. 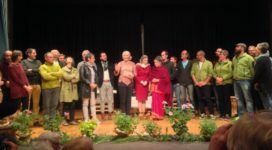 At the Bhoomi festival Valerie Cabanes , eminent lawyer from France spoke about the necessity to recognise ecocide – the destruction of the Earth and the environment – as a punishable crime. 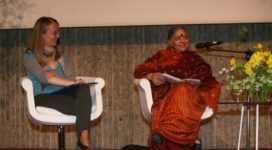 Citing the Indian court’s judgment to declare Ganga as a living entity with rights, she spoke about how there is a need to implement such steps all over the world. 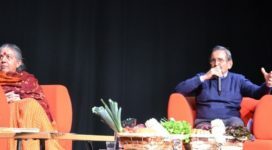 Her book “Rights for Planet Earth: Ending Crimes Against Nature ” was released by Dr Vandana Shiva at the event. The mountains are considered sacred in almost all cultures of the world and have been an inspiration of wisdom for societies across the world. 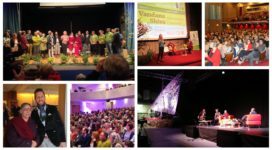 At Bhoomi 2017, panel discussions, talks ad presentations were held by some of the global pioneers of mountain ecology conservation, activists and mountain farmers. Keys speakers at the event were Chief Minister of Sikkim Pawan Chamling, renowned environmentalist and founder-director of Navdanya Dr Vandana Shiva, Andre Leu, President of the IFOAM, Ulrich Veith, Mayor of Mals, Dr Saamdu Chetri, Director GNH Centre Bhutan, Dr Sonam Dawa, CEC, Ladakh Autonomous Hill Council, etc.